Marathon Sport is a sports apparel and training company established in 2017. We are committed to developing the most elite products and training for athletes. Marathon Sport understands that for athletes to reach their highest potential they need to be physically and mentally balanced at all times. 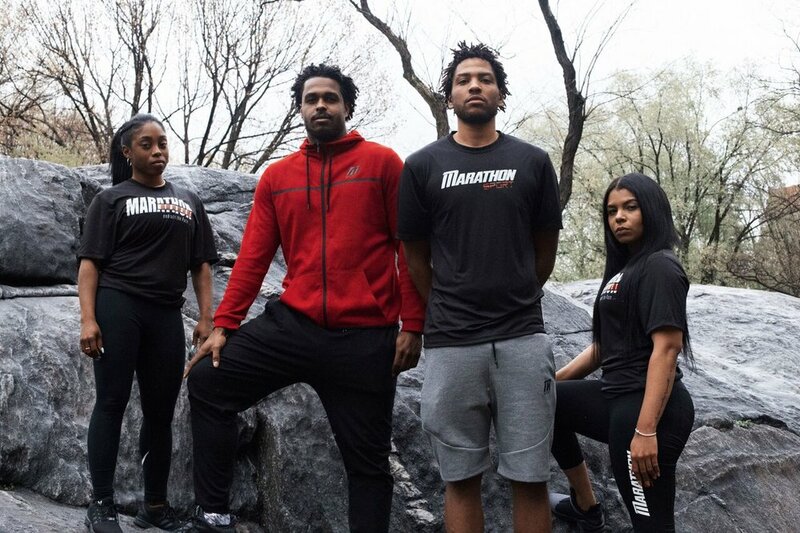 At Marathon Sport our mission is to be the global leader in sports lifestyle apparel while developing the world's most premier athletes physically and mentally. Our Marathon Sport company and staff is dedicated to being immersed in the sports industry and continuously strives to find new ways to develop, grow, and discover innovative athletic solutions. We are dedicated to the process of being great. Success doesn't come overnight so remain married to the process. Nothing worth having comes easy. Be willing to put in the work to achieve your desired results. Marathon Sport is committed to taking athletes to the next level. To do so, we continuously seek out and develop innovative solutions for the athletic community. We understand the importance of giving back and willingly accept the responsibility that we at Marathon Sport have to the to communities which we serve. According to most statistics, the odds were stacked against Khalif. He is the youngest of three children, raised by a hard-working single mother in Norristown, PA, a small town not far outside of Philadelphia. Due to a considerably age difference between he and his older siblings, Khalif was doted upon by his mother, sister and brother, all who helped shape him into the man that he has become today. In 2009, Khalif and his high school teammates battled their way to securing the PIAA District One title. This was a game where Khalif was able to really display his athletic prowess on the court. In the first half he alone scored 19 of the 20 points placed on the board. His teammates rallied behind him in the third and fourth quarters to bring home the championship...one that the Norristown Eagles had been chasing for 19 years! As his senior year in high school came to a close, Khalif had made up his mind to attend Temple University and continue honing his basketball skills under well-known coach, Fran Dunphy, where in his senior year (2013), Khalif was named the Atlantic 10 and Big 5 player of the year. Despite not being picked up in the draft, Khalif found himself being picked up by the Philadelphia 76ers in the 2014 season. He played with the team throughout the preseason and after being cut from the team, he landed a spot overseas, playing with a great team in China. This small town guy was on his way to an international playing field...his horizons were being expanded, as were his opportunities! While in China Khalif definitely made his mark and found himself being offered a spot on a team in Israel, Hapoel Eliat, where he played for 2 years before going to play for Hapoel Holon, where he has played for the past year. Playing on teams within Israel's top league has been a great experience where he has been able to hone his skills even further and was named Guard of the Year for 2 consecutive seasons. Khalif is still maturing, both as a basketball player, as well as a person. Giving back to his community is very important to him and therefore, Khalif looks forward to sponsoring different events, such as Norristown Appreciation Day and a Thanksgiving food drive and Christmas toy drive each year. In addition to these philanthropic efforts, Khalif also is diversifying his talents and now is beginning to look into real estate investing and has founded Wyatt 1 Holdings, LLC to work with like-minded individuals who, too, are interested in this type of venture. Overall, what Khalif has learned during his journey is that with hard work, motivation and persistence, you can bring your dreams to fruition....it's that MARATHON MINDSET that has sustained Khalif thus far and is what will fuel in the days to come.